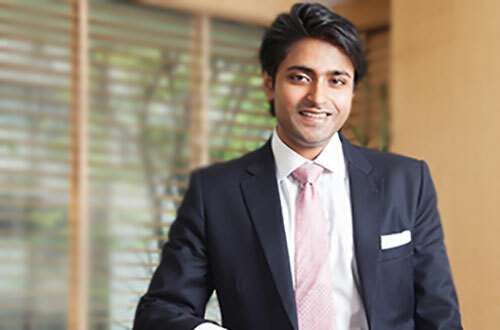 Mr. Jayvardhan Goenka is the youngest director of DB Realty Limited, one of India’s largest real estatedevelopment companies based out of Mumbai. Starting his career at the age of 20, he quickly earned therespect of all the members of the organisation due to his world-class education and efficient methods of working. Leaving home at the age of 12 to attend Aiglon College, a Swiss boarding school, Jay completed his IGCSE’s and A‐Levels with straight A’s, earning him a spot at the London School of Economics. He graduated from Aiglon College as its Guardian (Head Boy). In addition to the countless responsibilities as Guardian and his looming A‐Level examinations, he continued to set high standards for other students, by completing the Silver Duke of Edinburgh’s Award. He received the Virtus Award at his Graduation Ceremony, an award given in recognition of outstanding contribution to the school and service to the community. At the LSE, he graduated with a First Class Honours – putting him in the top 10% of his graduating class – and was conferred a Bachelor of Science degree in Philosophy and Economics from the prestigious institution. After completing a summer internship at McKinsey & Co. in New Delhi, Jay Goenka joined DB Group in 2011 Having gotten used to a very structured environment, Jay began operating in a similar manner in the company, keeping a friendly yet professional relationship with all his peers. Today, Jay, along with a competent leadership team, lead the activities of the Dynamix Group. The group is currently engaged in the development of over 6 million sqft of residential and commercial real estate across Mumbai, Thane, and Pune.